MI Mitt Cutting Board for sale. Buy online at Zingerman's Mail Order. Gourmet Gifts. Food Gifts. The cutting board that doubles as a map. Everyone from Michigan can skip the next paragraph. For the rest of you I have a couple brief notes. 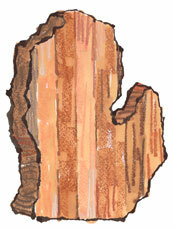 One, this is the shape of the lower half of Michigan; it looks like a mitten. Two, Michiganders love this fact. We use the shape of our state to answer questions all the time. For example, ask someone from Michigan where they're from. They'll invariably lift their right hand like they're swearing in at court. With their left index finger they'll point to somewhere on the palm and say "here." We consider this behavior completely normal. This cutting board—or serving board, your pick—makes a great gift for a Michigander, especially one who has been expatriated to a place where no one understands the palm trick. The company that makes it is 129 years old. They are from Michigan. The maple wood is from Michigan. It's especially handy for serving Michigan cheese and cherries. Made with durable slat construction, it makes a great gift. Apologies to Michigan's Upper Peninsula. We don't have a cutting board for you yet.